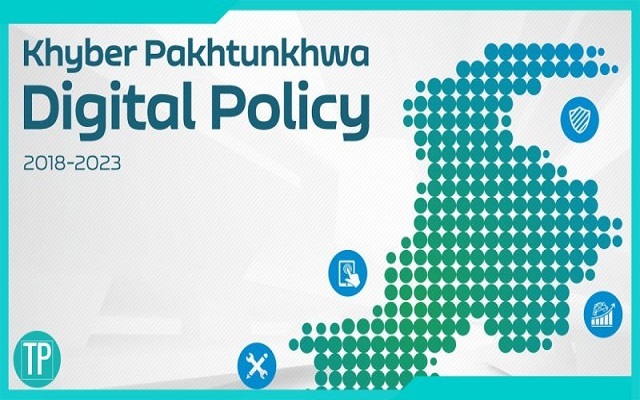 KPITB formally released its digital policy a few weeks ago. This policy is expected to transform governance in the province. The basic objective of the Khyber Pakhtunkhwa Digital Policy 2018-2023 is to provide guiding principles for the execution of KPITB’s functions. While sharing the main points of KPITB digital policy, Kamran Bnagish, Special Assistant of the chief minister on Science and Technology and IT (STIT), unveiled the basic aim of this policy, calling it the most efficient system for transparency. Managing Director, Dr. Shahbaz Khan introduced the main features of KP Digital Policy at its launch ceremony today. The KPITB wants to bring systematic digital transformation in Khyber Pakhtunkhwa by leveraging Information and Communication Technologies(ICTs). The basic aim of this digital policy is job creation, connectivity, empowerment, and inclusive economic growth. 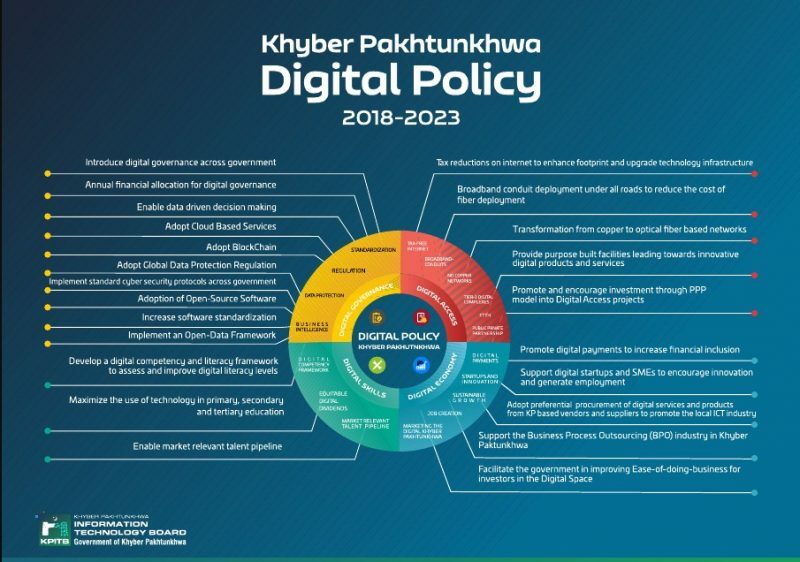 The Khyber Pakhtunkhwa digital policy 2018-2023 has basically four main pillars that are mentioned below. Digital governance: It is related to transform the way work is done on government level by the inclusion of standardized software and technologies like Blockchain. Khyber Pakhtunkhwa faces a lot of problems that include unemployment, gender-divide, lack of innovation, digital literacy, inequitable digital dividends, low accessibility, lack of necessary infrastructure and high government transactional costs with lack of transparency. So, the basic aim of this policy will be to create cross-sectoral growth opportunities in the province of Khyber Pakhtunkhwa to overcome such issues. Khyber Pakhtunkhwa took another lead among the Provinces of Pakistan to launch its Digital Policy for the next five years. The comprehensive policy focuses on four areas of access, governance, economy, and skills. KP Minister Finance Taimur Saleem Jahgra was the Chief Guest while Special Assistant to Chief Minister on IT Kamran Bangash, MD KPIT Board Dr. Shahbaz Khan, Milanda Good of the World Bank, Ali Naseer of Jazz briefed the participants of the simple but impressive launching ceremony about the salient features of the Policy. The Policy also specifically stresses over provision of digital access to the people of newly merged districts (defunct FATA) otherwise considered the most backward areas of the country. 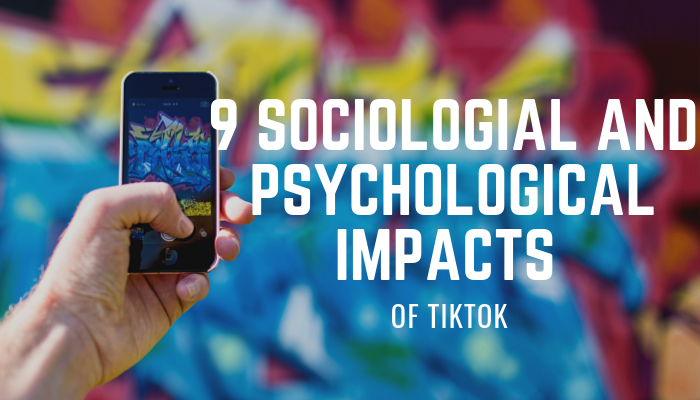 Some of the aspects of the policy are overarching and cut across the areas of financial inclusion and equitable digital dividends for women and marginal communities. It also focuses on an increased public-private partnership for facilitating the Province digital transformation. The policy emphasizes rapid implementation in the newly merged districts i.e. the built of defunct FATA and provision for the provincial share in ICT services from the Federal Government. Addressing on the occasion the Khyber Pakhtunkhwa Minister for Finance Taimur Saleem Jahgra regretted that internet was introduced in the Province as back as 1995 but the whole work of the Government organizations is still conducted through the old age papers and files. He regretted that sticking to that obsolete system is a wastage of both time and resources and also hampers service delivery. 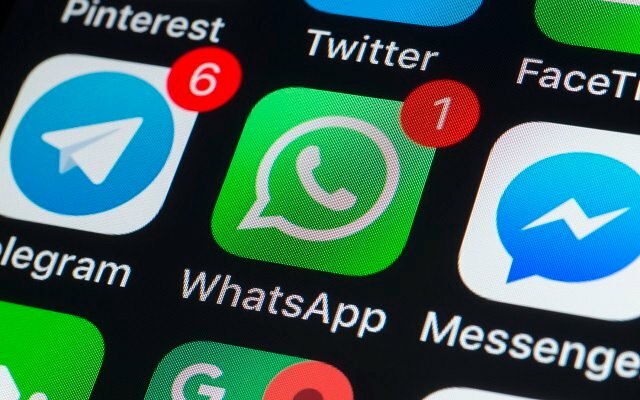 On the other hand, he pointed out that almost all Government functionaries are utilizing their private email addresses if ever they digitally do any public communication. This practice, he pointed out not only mixes private and public affairs but also creates security risks. However, the finance minister vowed to transform the Province and make a visible difference. Addressing on the occasion Special assistant to Chief Minister on IT Kamran Bangash said that though the digital policy was not part of the 100 days initiative of the PTI program in view of the need of the hour it has been prepared within less than hundred days. He said that each and every stack holders have been taken on board in the formulation of this Policy. He said that the Policy is based on the ground realities and provides for achieving realistic goals. However, he said that the Provincial Government is always open to any suggestion for inclusion in the said policy and would rather appreciate any proposal from everybody both for its improvement and achieving it targets in the larger interest of the people of the Province. He said that the newly merged districts of the Province are far behind from the other parts of the Country in digital infrastructure while on the other hand the whole Province is endowed with great potential of youth that’s why the Policy provides for optimum utilization of this resource. While addressing on the occasion the Country Director World Bank Pakistan Milanda Good appreciated the initiative of the KP government and assured that World Bank will always be there to contribute to its success. Ali Naseer of Jazz in his address appreciated the provision of public-private partnership in the Policy. The function was attended by a good number of IT professionals, academics and entrepreneurs.